Hand Lettering as a Left-Hander – Are You Doomed? I’m right handed. But I get a lot of left-handers writing in about things like smudged ink struggles due to drawing from left to right. I thought I’d bring in someone knowledgeable about the matter. 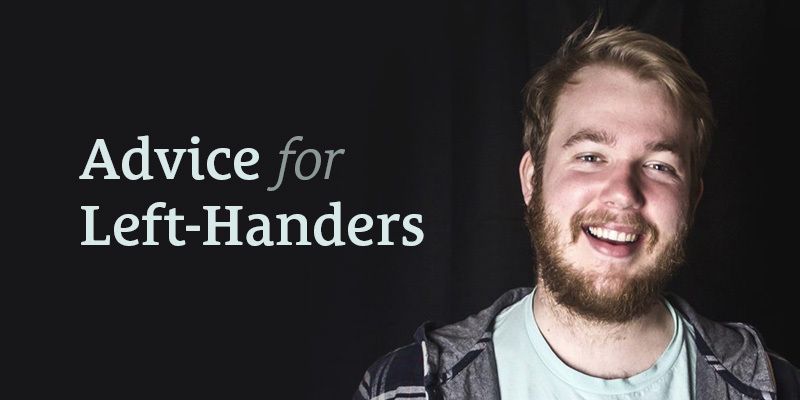 Today, I invited my friend, Winston Scully, to help provide some help and insight for left-handers in this short interview. He answers some of the common questions I get from left-handers. Right-handers with an open mind will get something out of this too. What’s the Primary Struggle for Left-Handed Lettering Artists? The biggest struggle I had with left-handed lettering was the mental barrier I had created. This mostly had to do with brush lettering. I was convinced that I wasn’t going to be able to do brush lettering because I was left-handed and it was a huge wall that my mind could not climb. Every time I would attempt, I would mess up very quickly, get frustrated, and quit. It wasn’t until I had some encouragement and advice from my friend and fellow lefty Neil Secretario that I was able to navigate these fears and issues. Sean’s comment: This was the most surprising thing to me. When I think of left-handers writing, I think about the common issues like smudging. When Winston pointed out that it was a mental barrier, it really got me thinking. We live in a physical world and we like to point to tangible things (like smudged letters) as being the culprit. But how many of the struggles or challenges we face are really mental barriers? When a left-handed person is attempting brush lettering, there are two different techniques to use. Inclined baseline: Keep your hand at the same angle as you would if you were writing left to right directly, but angle your paper steeply. Write along the baseline at the angle of your paper, this technique will allow you to keep your hand down on the surface of the paper with rubbing it across the fresh ink. In the above video, you can see my hand is slightly above the letters I’m writing. When I first started with this technique, the angle was much more drastic. Eventually you will get comfortable enough to write at a less extreme angle like I am doing in the video. When starting out, I suggest practicing a steep angle to get used to keeping your hand above what you are writing. If you’d like to see more examples and videos of lefty brush lettering, browse this hashtag on Instagram. Hovering: This technique is admittedly much more difficult to master, but if you can get it down it is extremely versatile and can apply to many other lettering sub genres like: chalk lettering, sign painting. The idea here is to grip your tool higher than you normally would, and hover your hand over the surface of the paper while you write. Then brace your hand with your non-dominant forearm by holding it under your wrist and allowing it to move while you write. Sean’s comment: The artist pictured is obviously right-handed, but the hovering technique shown is similar to what Winston is describing. It’s from a documentary called Sign Painters which I was reminded of while reading Winston’s reply. 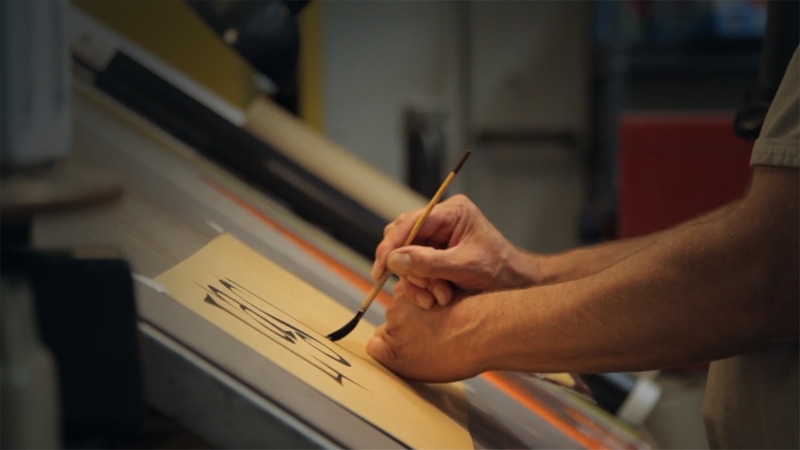 Sign painters work with wet ink, so they have to use creative methods to avoid smudging no matter what their dominant hand is. Something that will help you master kerning within brush lettering is setting a wireframe for your first few iterations. Draw out a rough sketch with a pencil of your piece, and trace over it with your brush pen. These wireframe iterations never come out as a finished piece, but it gets your hand and mind use to where the letters are suppose to go in whatever piece you are working on. After you’ve practiced a few times with a wireframe, try doing it without the wireframe. You’ll find yourself placing the letters where they need to go much easier and will be able to crank out iterations faster with less kerning issues. Sean’s comment: Kerning is the space between your letters. A lot of the comments and questions I receive from left-handed hand letterers mention having a hard time with keeping consistent spacing because their left hand covers up the letters they’ve already drawn. I typically create a pencil wireframe no matter what, but I found Winston’s suggestion of first creating with and then creating without a wireframe interesting. Essentially, the wireframe serves as practice for you to “learn” the spacing so that you’re able to do it without a guide. If you’re drawing the letters as opposed to using a brush pen, the best tip I have for you here is to use a harder lead and use a hand cover sheet. I typically use a 2H lead, anything harder than that is too light for me (for sketching). You can get away with H lead and not smudge too bad, but HB and anything softer will surely end with lead all over your hand and paper. For a cover sheet, you can use anything you prefer. I typically have a sheet of sketch or copy paper on hand, but tracing paper can be used in order to see other details of the piece that are covered up. Sean’s comment: I’d never heard of using a piece of paper to rest your hand! That’s a great tip for preventing smudges. I don’t know why I didn’t think of this because I still end up smudging things as a right-hander when I go back to add details. This will definitely help. The best way to address kerning here is to re-draw your lettering piece with tracing paper over and over again. This is customary for any lettering artist, but is more essential for the lefty because your hand is covering up what you just drew. Another technique I’ve used is actually drawing the piece backwards on the tracing paper. In other words, starting with the last letter and moving from right to the left instead of the going from left to right. Once you’ve got your first iteration, try this technique on the next tracing. You’d be surprised how much this trains your eye to see the shapes of the letters and negative space overall. There is no “trick” to being successful at left-handed lettering. It’s a very small barrier that is easy to overcome with the right mindset (or maybe the left mindset? Ha!). Practice, practice, practice, and don’t be afraid to get your hands dirty.